This Shumate family history consists of two major parts. The first is a narrative account of the family in seventeenth century France and their battle to be free of religious persecution; the immigrants--Jean de la Chaumette and his three sons--John, Samuel, and Daniel--who settled in early Stafford County (now Fauquier), Virginia; the first five generations to include the Descendants of John [II] and Daniel [I] in Virginia; and Daniel Shumate [V] and his Descendants, many of whom living today are widespread throughout the United States. The second part of this book contains supporting documentation for the narrative account and genealogical lineage charts. There are twelve appendices which document and clarify the lines of descent contained in part one. They consist of church and other records of the family in France and England; extracts of primary and secondary records of Virginia and Kentucky to include probate, deed, tax, and marriage documentation; Federal Census extracts; gravestone inscriptions; and lineage charts constructed to trace one's own particular line of descent. I want to assure the reader that professional researchers and I, myself, obtained the documentary extracts appearing in these appendices from the Federal Archives, the Virginia and Kentucky State Archives, and various county court files in the United States; from the official national and department (provincial) archives in France; and from well known Huguenot libraries or societies in France and England. A complete reference has been provided for each of the documentary extracts, indicating where it can be found in the official files of those records depositories. I first became interested in the Shumate genealogy circa 1976 while I was serving in the U.S. Army at Fort Leavenworth, Kansas. I taught military strategy and policy at the U.S. Army Command and General Staff College. I soon discovered that the college library had a microfilm reader room and that I could order Federal Census microfilms on inter-library loan from the branch of the National Archives located in Kansas City, Missouri. This practice has now been discontinued by the National Archives. Also, I had heard my grandmother and great-grandmother relate many interesting stories of my ancestors when I was a boy. As an eager novice to the world of genealogy, I took a short course in genealogical research and came to the conclusion that I could learn the complete history of several of my families in just a few short months. As the light of reality began to prevail and as my experience over the years has taught me, I know now that one can spend a lifetime involved in family research and still not resolve the family relationships or obtain all the answers. This family history is the product of what I have learned over the years since about the Shumates, and I want to share the information I have acquired with all persons who may be interested in this family of ancient French origin. In the late 1970s, I obtained a copy of The Shumate Family, A Genealogy, by Theodor-Friedrich von Stauffenberg (a nom de plume? ), whose work was published in Washington, D.C., in 1964 by Phyllis E. Hendrick Duplicating Services. I read, studied, and analyzed The Shumate Family at great length and became even more confused and puzzled, because T. F. von Stauffenberg provided no clue about the Shumate family from which I am descended. To my surprise and disappointment, he did not even acknowledge that the Shumates of Breckinridge, Hardin, and Meade Counties, Kentucky, existed. At first, I was astounded by his oversight but came to realize that he had really not conducted an in-depth review of Kentucky records and that his research of available Virginia records had provided some questionable interpretations. After my analysis of his book The Shumate Family and a lot of personal research of my own in the public records of Virginia and Kentucky, I came to the conclusion T. F. von Stauffenberg had made a few incorrect assumptions regarding the known individuals of the early generations in Virginia and thereby had erred in aligning their descent. Furthermore, he had depended largely upon input from the Descendants of certain lines of the family. Most of this input was not based on documentation but had been passed by family knowledge or tradition that possibly contained inaccuracies. However, despite the errors in his book, T. F. von Stauffenberg made a profound contribution to the history of the Shumate family, and all living Shumates and Descendants owe him an immense debt of gratitude. Not being satisfied with some apparent errors in The Shumate Family and the lack of information about the Kentucky Shumates, I decided to research and to rewrite the family history to correct the obvious mistakes and omissions made by T. F. von Stauffenberg. With this aim in mind, I established three goals to achieve in the process. They are: (1) To provide as much documented information about the origins of the early family in France as possible and to publish it for the record; (2) To correct T. F. von Stauffenberg's misalignment of the lines of descent in the first five generations of the Virginia Shumates and to provide documentation in support of those facts; and (3) To provide the missing link of descent for Daniel Shumate [V] of Garrard County, Kentucky, with his ancestors in Fauquier County, Virginia, and to publish a genealogical record of his Descendants. 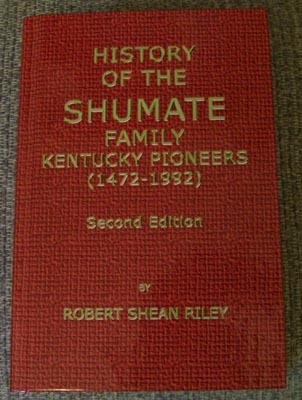 I have made an honest, conscientious effort to relate this Shumate family history to the best of my knowledge and ability. However, I will be the first to acknowledge it is not a work of perfection, because the location of necessary official documentation to prove certain family relationships is either unknown or it has never existed. Also, I have been unable to obtain much needed family information to complete many of the voids and unknowns appearing in the narrative and lineage charts. The reader should especially note the Shumates of the earlier generations passed many of the same male given names. These names have caused considerable confusion in distinguishing the different individuals who carried those names. The names that appeared most frequently were John, William, Thomas, Daniel, James, and George. I have followed the same system devised by T. F. von Stauffenberg by assigning a Roman numeral to each man who had a particular name based on the chronological order of his birth and not necessarily by his line of descent. However, because information about many individuals beyond the fifth generation and their birth dates are not available, the numeral system became impractical to continue. Also, the reader will note that the narrative paragraphs of Chapters 3, 4, and 5 are numbered in an unusual manner. This numbering system matches the numbers assigned to each chart and line of descent appearing in the Family Group Charts found in Appendixes G and L of this book. Further, many readers or members of collateral lines may question why information about those families is not included. The answer is quite simple. This book is only about the Shumate family. To include information about the many collateral lines--those which the Shumates married into--no doubt makes the task of writing this family history impractical if not impossible. Therefore, the goals which I outlined previously above are quite challenging and establish a difficult task for a single writer to accomplish. If an individual desires the history about a collateral line, then he or she should seek out that family history, if it is already in print, or if it is not, he or she may decide to assume the task of researching and writing it. My research for this book has been a part-time effort for approximately twenty-five years. At times during this period, it in became almost a full-time job to write, revise, and prepare the manuscript in "camera-ready" format for publication. The reader should be aware the immigrant Jean de la Chaumette and his three immigrant sons have thousands of Descendants spread throughout the United States today. One can pick up the telephone directory of nearly any large or mid-sized city in the South, Mid-West, or Southwest and find Shumates listed. Even in the city of Lawton, Oklahoma, which has 92,000 inhabitants, there are listings of Shumates, Shoemates, and Shuemakes in the directory. Also, the name is often found in the East and West Coast states; however, in all probability there are not too many in New England or the colder northern states--North Dakota, Minnesota, Wisconsin, and Michigan. Upon reflection, all living Shumates and Shumate Descendants can take great pride that their ancestors were pioneers who departed their homes in Virginia--Fauquier County--and migrated southward and westward to explore and settle the frontiers of our great country as it expanded in its "manifest destiny." The early generations of the family contributed much to our great land, and all Descendants can be justifiably proud of their accomplishments.